A Republican from southeastern Wisconsin is officially in the race for governor. 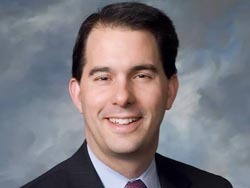 Milwaukee County Executive Scott Walker kicked-off a statewide tour in Green Bay this morning by announcing that he&apos;s running for the state&apos;s highest office in 2010. Walker wasted no time going after Democratic Governor Jim Doyle, saying his proposed state budget would hurt families and businesses. He says the governor wants to increase spending and taxes, while people are already struggling to keep up. Walker says he wants to live in a state where students have affordable options for higher education and where families can access affordable health care. Walker ran for governor in 2006, but dropped out of the race when Mark Green emerged as the favorite to challenge Doyle. This time around, he&apos;s expected to face a primary challenge from former Republican Congressman Mark Neumann. Governor Doyle has been raising money for a potential run for a 2010 re-election bid, but has not announced his intentions so far. Audio courtesy of Mike Kemmeter, WHBY.